The Indian state Uttar Pradesh is popular to have few religious cities and towns. One of the important cities with religious significance is Muzaffarnagar. This is one of the places, wherein people from different religious communities meet at a number of religious and spiritual places to make India as one of the most diverse but united country. Muzaffarnagar encompasses a number of sacred and religious places wherein devotees from all corners of India and even abroad pay a visit and become spiritually rejuvenated. One such place with religious sanctity is Shukratal, which is located in Muzaffarnagar district. This place is basically a hub of several religious spots, which makes it important for the devotees to drop in. Right from having a couple of grand statues of Hindu gods and deities to having the ages old banyan tree it has a number of such things that are worth exploring. This religious town is an array of certain religious spots, temples and idols which is often being visited by thousands of devotees all across the country. As per the Hindu religious experts, though you have several other religious places in Uttar Pradesh but Shukratal has its own importance. It is the places wherein spiritual deliverance simply waits for the devotee who has come here to seek a real cosmic salvation. Digging deep into this religious town, you can find certain religious spots that are worth discussing. Shukratal is also known as Shukrteerth, which means a land of praises. The importance of this place has been there since ages and has a deep connect with the ancient India. As per the Hindu scriptures, a very much respected Hindu saint called Swami Kalyandey Maharaj has put his rigorous efforts and dedication along with lots of sacrifices in order to propagate the importance of this sacred place to the world. As per Hindu beliefs Swami has led three centuries in doing this task of propagation among different communities in North India. This is the same town wherein as per the Hindu beliefs the holy book called Shrimad Bhagwad (also known as as Shukteerth) was first given by another revered saint called Rishi Shukdevji. Also, as per the Hindu beliefs around 5,000 years ago, Rishi Shukdevji was seen narrating the entire religious scripture Shrimad Bhagwad to king Parikshit Maharaj for duration of one week till he breath his last when was bitten by a snake. The Hindus also believe that this snake was King Takshaka who was converted into a reptile due to the curse given by him. One of the most popular religious tourist spot is Vat Vriksha, an old banyan tree. This tree is connected with the times of Mahabharata (the Great War). 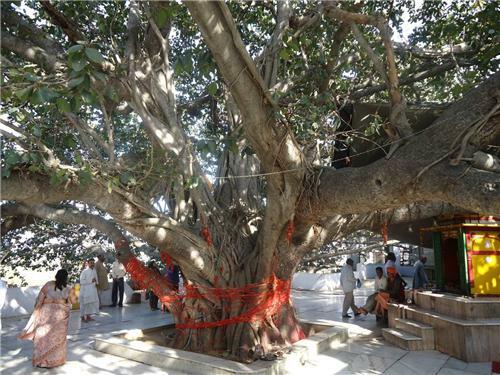 As per Hindu belief, this banyan tree (Vat Vriksha) has seen the entire episode of king Parikshit Maharaj, which has made this tree immortal for ages. Vat Vriksha is of 150 feet height and is supposedly 5,100 years old tree and is still green today. It casts some of the most soothing kind of shadows, while the branches of the tree resemble to the hands of any god who shower his blessings on people coming to his refuge. The uniqueness of this tree is that you would not see any single fibrous practical roots coming out from it. Vat Vriksha has become symbolic to peace and forgiveness wherein every year religious devotees come to take the blessings of god from this tree. The devotees do a parikrama (circling over the perimeter of Vat Vriksha) on foot. It is believed that this tree was planted by Vijaypal Baghel and Swami Omanad. Listed below are dhams in Shukratal. 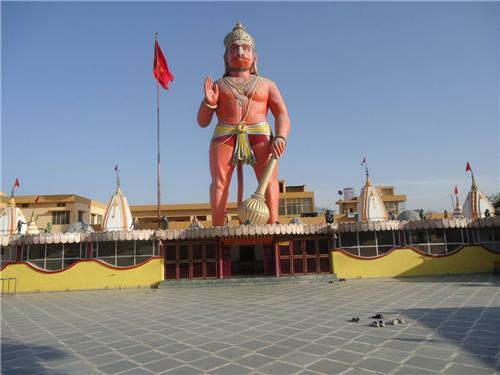 This is basically the idol of Hanuman, which is considered as one of the largest one in the world built in 1687. The height of this idol is 72 feet along with the stoop. As per the historians, more than 700 paper chits with different gods’ names have been put inside this idol. The people behind building up this massive size Hanuman idol are two people, the first one was the known writer called Sudarshan Singh Chakra who along with his disciples proposed the idea of making this idol to Swami Kalyandev ji Maharaj, a supreme authority of 17th century. It was constructed by one of the known artists, Keshav Ram from Shadol, Odisha. This idol is located close to Shukdev Temple, which is based over the banks of Ganga River. Just beside the Hanuman idol one can find a number of rooms that are being constructed for residential purposes for the saints, devotees and other people visiting this religious town. In terms of location the idol of Hanuman too has a great importance. It is surrounded by a number of temples from different sides of a number of gods and deities of Hindus. Another religious spot in Shukratal is the grand statue of Ganesha, which is commonly known as Ganesh Dham. Ganesh is one of the important deities of Hindu community. 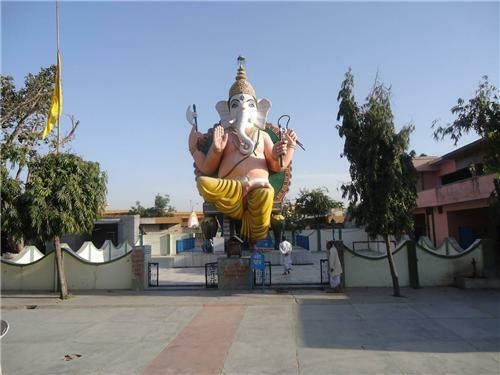 People behind this huge 35-feet-high celestial Ganesh idol are two residents of Muzaffarnagar: Lala Sukhbir Singh and Lala Lakshmi Chand Singhal. This Ganesha idol is considered as unique in many ways. Over the right of the statue is the immortal Vat Vriksha and to its left one can see the auspicious Tripatha river flowing. Over the back side is Shukdeva Teela wherein the massive size idol of Hanuman is standing. All these factors simply add beauty to Ganesha Dham. Another idol that is found in this religious town of Shukratal belongs to the goddess of strength and power known as Durga Ma. It is generally denoted as Durgadham, which is just located near the idol of Shanker idol. The height of Durga idol is of 51 feet. You can find one cave adjacent to this idol, which was developed by a team of devotees based in Muzaffarnagar a couple of years before for spiritual activities like meditations. Another worthy place to be discussed in Shukratal is Shiv Dham, which carries a huge idol of Shankar. It also carries a number of other idols as well, which is located over the North West side of Shukdev Temple. The total height of the Shankar idol is whopping 101 feet, which makes it appear from faraway places. Shukratal is a religious town located in Muzaffarnagar district, which is basically 27 KM away from the Muzaffarnagar railway station. It is located over the Bhopa road and comes just when you cross the Morna village. It's half an hour drive from the town. It is connected by all the public transport, however, the amount of time to reach this place can vary as per the traffic and road conditions. If you take a cab you would approximately pay Rs 200 to reach out to this religious town. A couple runs an orphanage on an eight bigha plot of donated land in Shukrtaal. There is also a small school on the premises. Currently, they have 46 children under their care — most of the others grew up, took up jobs, got married, and moved away — and the entire expenditure is met through donations. If someone can add the name and address of this noble institute and or person to whom donations can be sent, it will be serving a cause.if I can be connected through my email at i will be happy to contribute to this noble cause. This is very very energetic and religious spot and I always would like to come here again and again .and obviously Saint Swami Kalyan Dev Ji Maharaj was very inspiring sprit. And great contributer to build up holy environment.That's very proudable moment whenever I visit here.Thanks to all of them...who making the religious efforts, and fiscal contribution. To maintain or manage this religious environment.